Malami The Attorney General of the Federation and Minister of Justice, Abubakar Malami, yesterday, his broke silence on the allegation that he spearheaded the recall, promotion and posting of Maina to the Ministry of Interior. Malami, who grudgingly spoke to Vanguard, last night, said he would rather respond to the avalanche of allegations against him when he formally appears before the Senate, which had summoned him to speak on his role on the entire saga. Pressed to clear himself of the weighty allegations, Malami said: “I am a legal practitioner, who is always guided by law and public interest and will therefore not do anything that deviates from the law or breaches public interest. “I believe that Nigerians are entitled to know the truth in the entire saga and I am ready to speak directly to them when I appear before the Senate since I have been summoned by the legislature, which is investigating the matter. Meanwhile, details of how the Attorney General of the Federation and Minister of Justice bypassed the Head of Service of the Federation and used the Chairman of the Federal Civil Service Commission to reinstate the wanted chairman of the defunct Presidential Task Force on Pensions Reforms, emerged last night. This came as the Economic and Financial Crimes Commission, EFCC, yesterday continued with identification and marking of no fewer than six houses in many parts of the country traced to the wanted Maina. Spokesman of the commission, Wilson Uwujaren, confirmed the raid on the identified properties but did not disclose nature and locations of the property. “We have continued our efforts to track Maina down and our operatives have also intensified the identification of properties which he might have used the proceeds of corruption to secure while in office,” the spokesman said. 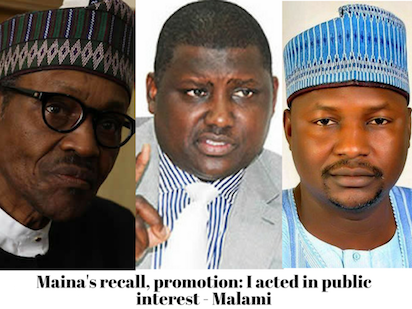 Top federal officials conversant with how the AGF got Maina back into the federal service after he had absconded for over three years, described Abubakar Malami’s action in the recall and promotion of Maina as desperate and a breach of known public service rules. Vanguard learned that in his desperate bid to return Maina to his post, Malami wrote two memoranda to Oyo-Ita to recall Maina based on the lame argument that no court of the land had convicted him of any offence but the woman ignored him since she was sure the chief law officer had breached established rules of the civil service. The development emerged, as some Nigerians yesterday questioned the President’s power to sack Maina without referring to the appropriate government body with relevant powers to do so. But on its twitter handle, the Presidency said Buhari breached no known law, having given approval to the appropriate government agency saddled with the responsibility of disciplining erring officials. The Presidency said: “Reports that due process was not followed in the disengagement of Mr. Maina from service are incorrect. “The President directed the appropriate authorities to effect the disengagement in compliance with due process. “President Buhari will continue to ensure that due process is followed every step of the way.” ‘FCSC letter, not HoS recalled Maina’ A top source with inside knowledge of the matter told Vanguard yesterday that Malami did not only recommend Maina’s recall, but also cleared him of any wrong-doing, thereby paving the way for the FCSC to recall him. “That was why Maina’s letter of reinstatement dated September 18, 2017, and signed by one Mustapha L. Sulaiman for the FCSC chairman, was written from the FCSC, even without an input from the HoS,” the official said. Speaking on the matter, Chairman of the Association of Senior Civil Servants of Nigerian, ASCSN, Office of the Head of the Civil Service of the Federation Chapter, Comrade Bolaji Sunday Olaiya, said it was wrong to drag Oyo-Ita into the mess created by the AGF and the FCSC in their bid recall Maina at all costs. Olaiya said: “If anybody is to be questioned, it is the man who signed the letter on behalf of the HoS, giving the impression that the letter came from the office. “The person must have soiled his hands somewhere along the line as you can see, that even the reference ‘4029’ which is used in the letter is fake and incomplete. The 4029 is not a complete reference; he is trying to mislead the public and the Nigerian people. The correct reference starts with ‘FC4029″.